A new Fresh & Easy market recently opened a few blocks from the house. That is unexciting news unless you’re old and weird, as I appear to be. So it was great news to me, especially since the other nearby markets are in crowded areas at least a mile away, and feature everyday high (and seemingly higher by the week) prices. But as fun and interesting as it is to talk about grocery shopping, it isn’t really why I’m here today. 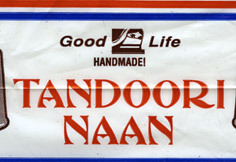 I am here to show you my naan label. I picked up the naan at Fresh & Easy (see how I tie it all together? Now that’s high quality writing, kids!) and as I was enjoying a big hunk of it covered in hummus, I noticed the logo on the bag: Good Life HANDMADE! TANDOORI NAAN with a little graphic of what is presumably a woman, wearing a veil. I’m not sure what to make of that. What the implication is. That it’s a good life to wear a veil, stop going to school when you’re eight years old, never drive a car or show your face in public, never look a man in the eyes, always walk a few paces behind them? Yeah boy, the good life of a traditional Arab woman! Woo! No wonder they get excited about HANDMADE! flat bread in a bag. At least they didn’t have to make it themselves over an open fire. Now before you go off all cocked and bothered, yes, I know that a lot of Arab women live normal, modern lives. I had a Lebanese girlfriend 20 years ago (although her family had to come to America when the Lebanese civil war broke out in 1975 in order to maintain a normal, modern life). She advised me that when I was in Tunisia I should try to get to Libya somehow and shake Muammar Gaddafi’s hand because he was a great man, and that the PLO were really okay guys and intifada was a good thing. In other words, she was Arab down to the marrow. But her picture isn’t on the bread bag. A veiled woman is. A veiled woman living the good life! But what do I know. Maybe freedom is overrated.